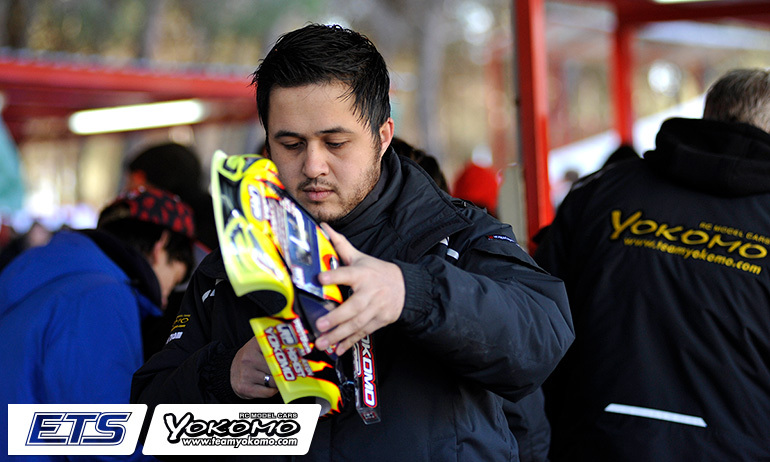 Freddy Sudhoff put in a dominant performance in the opening A-Main this morning at Round 3 of the Yokomo Euro Touring Series. Starting from a career first TQ, the Awesomatix driver immediately pulled clear of the field in the cold conditions helped by a slow starting Ronald Volker from second on the grid who stacked the field up behind him. 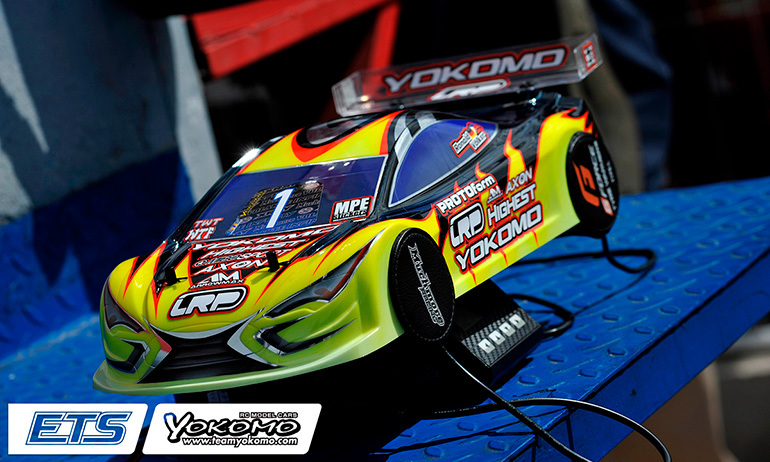 Marc Rheinard would be the only one to find away passed the Yokomo, driving around the outside of his fellow countryman. Setting about chasing down Sudhoff, Rheinard would unexplainably spin off the track at the loop, dropping him back into the clutches of Volker and Christopher Krapp with a second spin at the end of the straight allowing both to go by to battle it out for second as Rheinard struggled with his car and dropped to last. Afterwards the Infinity driver said everything on the car appeared fine so the only other explanation he could think off was a possible issue with his set of tyres. Seeing off the challenge of his team-mate Krapp, Volker would hold onto second with Akio Sobue fourth, almost 3-seconds back. Commenting on the first A-Main encounter, Sudhoff said, ‘I was a little but lucky Ronald dod not have pace at the beginning and blocked the field’. He continued, ‘It is very cold this morning so the first few laps it was loose in the rear but after 2-minutes it was stable. The car is performing awesome and if I need more speed it is there’. Looking to A2 when he could potentially claim his first ever ETS victory, the German said, ‘I will try to do the same thing but it is more than 2-hours away so its going to be a new track and another new challenge’. 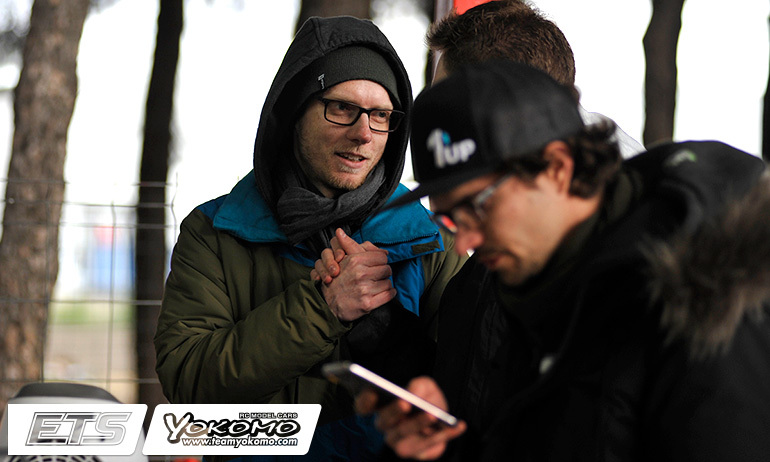 ‘I have mixed feeling about this one’, was Volker’s reaction after A1. The championship leader continued, ‘I suffered with rear grip the first few laps which was the complete opposite to Marc so I couldn’t fight him. After 2-minutes the rear grip came in and luckily I was able to stay second. I can’t be too unhappy with the result given how the car was at the start and I’m happy Christopher now has a good car too and could finish P3. We had a good battle’. The former World Champion added, ‘we might have a set-up issue when it is very cold but A2 will have a little sunshine which should help warm things up. We will consider our tyre prep near to the race time’. Starting from 7th on the grid, Krapp said, ‘I am happy to get a good run after a not so good qualifying. The car and driver were not on point’. Losing out on the win here in Spain last year on the tie break, the German added, ‘we changed a bunch of things on the car and went more in the direction of Ronald’s set-up but I also drove much better than yesterday. I would have liked more from the race as I think my pace now is better than 3rd’. He concluded, ‘I hope more stuff happens in the next one’. In the first of the Pro Stock A-Mains it was also a dominant win for Top Qualifier Simon Lauter as the Top 3 finished as they started, Olivier Bultynck second and Dominic Vogl third. In Formula, pole sitter Jan Ratheisky lost traction on the first corner allowing the Infinity of Jitse Miedema through for an easy win ahead of the Serpent of former champion David Ehrbar as Ratheisky battled for third with Spain’s Ivan Lopez who got the better of the reigning champion. 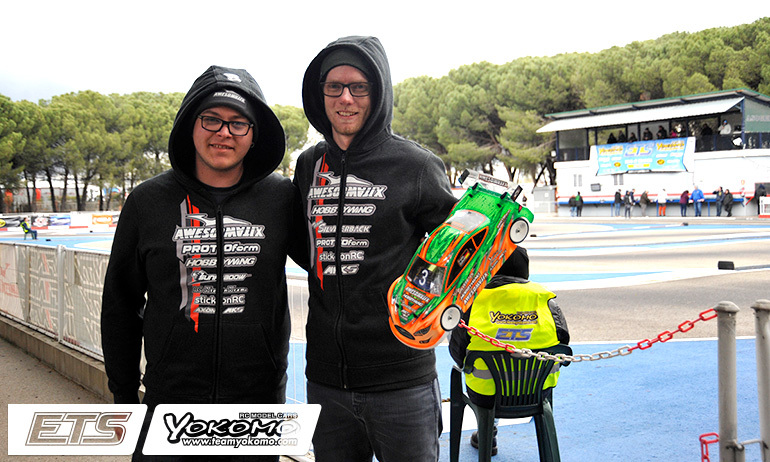 Freddy Sudhoff is the Top Qualifier at Round 3 of the Yokomo Euro Touring Series in Spain. The Awesomatix driver claimed both his and his team’s first ever ETS TQ when he topped Q2 this evening in Madrid. With bad weather causing qualifying at the Asoger RC track to be reduced to just two rounds, Sudhoff would take advantage of improved track conditions to top the Q1 TQ time of Ronald Volker by seven & a half seconds. 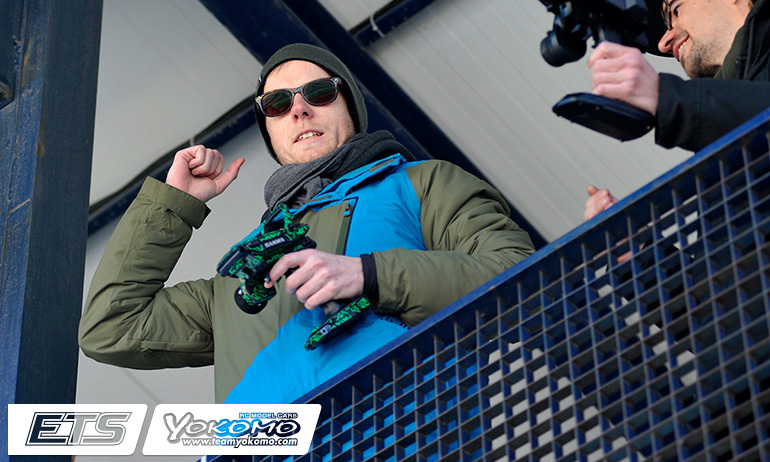 With the Yokomo driver starting 2nd on the grid, a P2 in both rounds gives Marc Rheinard 3rd in the grid ahead of his Infinity team-mate Viktor Wilck. For Bruno Coelho, the second qualifier saw another mistake from the reigning champion and the Xray driver will start 5th with team-mate & last year’s winner Alexander Hagberg facing an even tougher prospect tomorrow starting from P10. ‘My first TQ ever, I’m more than happy’, was Sudhoff’s reaction to securing pole position. Backing up his impressive showing at the previous round in Daun, the German described his Q2 performance as a ‘maximum good run’. The German explained, ‘I did no warm-up laps this time and I changed the speedo set-up and it was perfect from the first to the last lap’. He added, ‘When I saw Bruno rolled I could take it a little bit easy’. Asked his plan for tomorrow’s scheduled triple finals, he replied, ‘just continued like this. Of course we need to check the weather but I am confident with how the car and power is feeling’. Volker said he ‘made the wrong call on the diff’ for Q2. Ending up 1.4-seconds slower than Sudhoff, the championship points leader explained, ‘I went to the diff from Thursday practice but the temperature today was lower. I struggled with on power traction but I have nobody to blame but myself. I am definitely going back with the diff but we also have to see how the track conditions are tomorrow’ – more rain expected overnight and early in the morning. Asked about challenging for the lead, the former World Champion said, ‘you can’t pass easily unless you have high grip so I think track conditions are the key to the outcome. Anyway P2 on the grid is not too bad and I’m happy for Protoform that the Type S is 1, 2 on the grid’. Rheinard explained, ‘I did the same as in the first one and didn’t do warm-up laps. It worked out in Q1 but this time between the start line and the loop it spun out. I hadn’t crossed the loop but I lost confidence after that. Still it is good to start 3rd’. Asked his thoughts for the finals, the German who has not had an ETS win on asphalt for more than four years, replied, ‘for sure it is going to be difficult with conditions tricky to drive. Also the first A-Main is in the morning when it is extra cold. 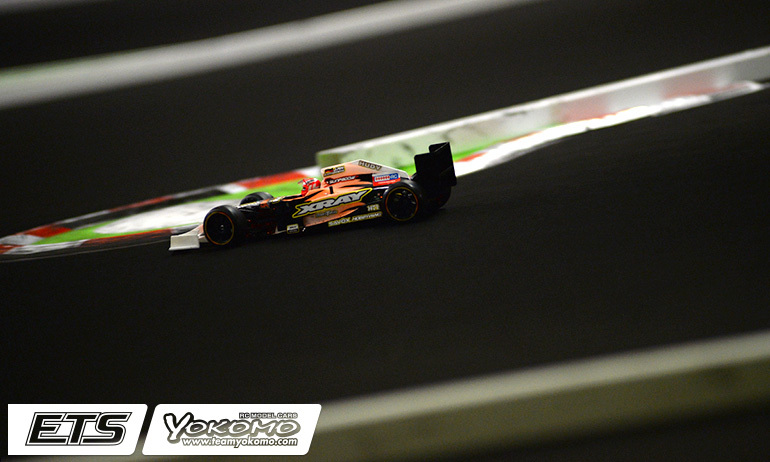 The pace is there for sure to race for the win and so far we have four cars in the final’. In only his second ETS outing with Infinity, Wilck was content with his P4 on the grid. Commenting on his Q2 performance for which he got a P4, the Swede said, ‘I think it was a little better. I drive too careful at the beginning but drive good from the middle to the end. With Bruno’s mistake I could take 4th overall’. Happy with the changes to his car for Q2 he added, ‘for now I will keep the same set-up for tomorrow’. On the race he concluded, ‘there will always be some incidents so the result will depend on getting a clear run or not’. ‘A tough round again, conditions are very difficult’, was how Coelho described the second qualifier after he flipped his car again on the curbing. 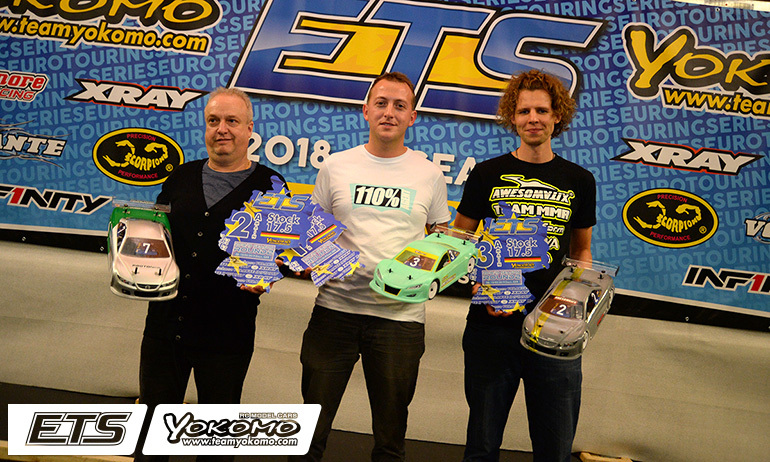 The winner the first time the ETS came to the Spanish track in 2017, he continued, ‘the first one minute 30 the car is very good but then I struggle to stay on the same pace as the others. We will change many things to try make it better for tomorrow but starting 5th is it going to be super difficult to go for the win but we must try’. Behind the Portuguese driver Akio Sobue will start sixth with Christopher Krapp 7th, Yannic Prümper 8th and Elliott Harper 9th. 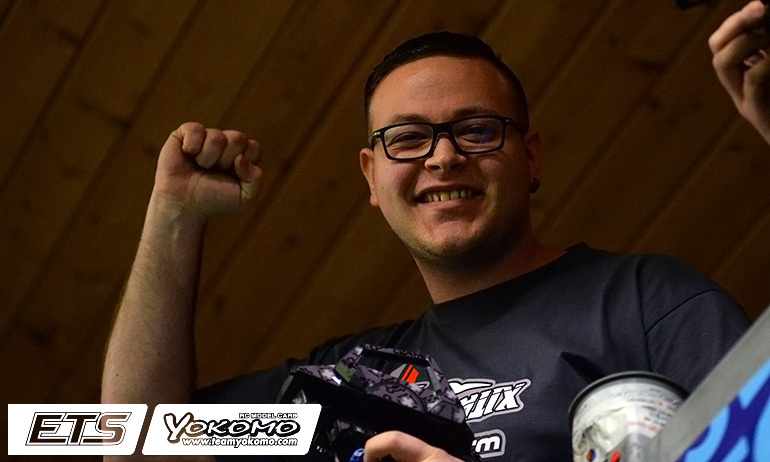 With Sudhoff’s Modified TQ, Simon Lauter gave the Russian designed car double reason to celebrate as he secured the Pro Stock TQ after taking both qualifiers. The German heads an Awesomatix’s Top 6 lock out of the grid with Olivier Bultynck 2nd ahead of Dominic Vogl, joint championship leader Max Mächler, Christian Donath and Toni Rheinard. In Formula it was an Xray affair at the top of qualifying with reigning champion Jan Ratheisky taking pole with his Q1 TQ time over Infinity’s Jitse Miedema who topped Q2. Bultynck completes the Top 3 ahead of Lauter. 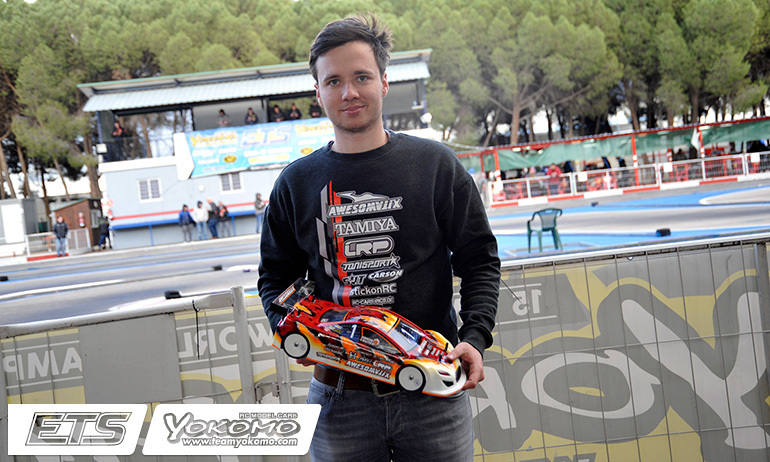 In the 40+ Masters popular Spanish driver Toni Mateo took both qualifiers to deny early championship dominator Alexander Stocker the TQ. The new 17.5 Stock class will have Tobias Baumbach leading away the A-Main from Daniel Pöhlmann who took Q1 with Luis Moreno lining up 3rd. 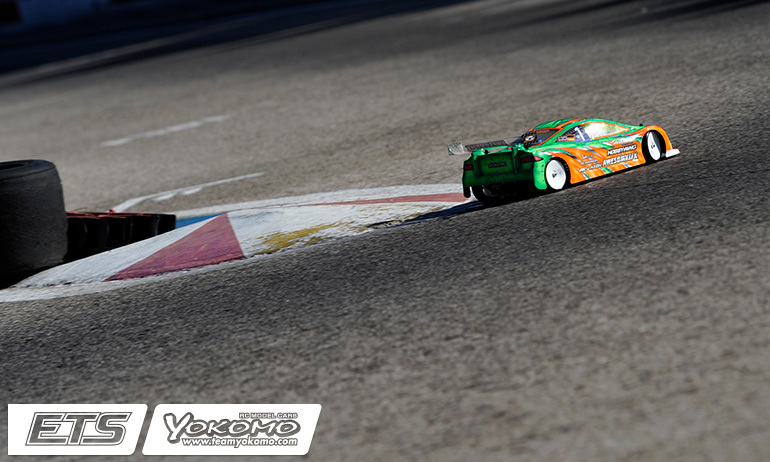 The first outdoor round of the Yokomo Euro Touring Series finally got underway this evening in Spain with Ronald Volker taking what could prove a very important TQ run in the first of the two qualifiers on the revised schedule. With yesterday’s action completely washed out, drivers arrived to a dry Asoger RC track this morning allowing for a round of practice in qualifying heat order. With qualifying finally getting underway it didn’t take long for rain to briefly stop things again but it was only Mother Nature’s warm-up before the action was halted again by a huge downpour meaning another frustrating delay for drivers. 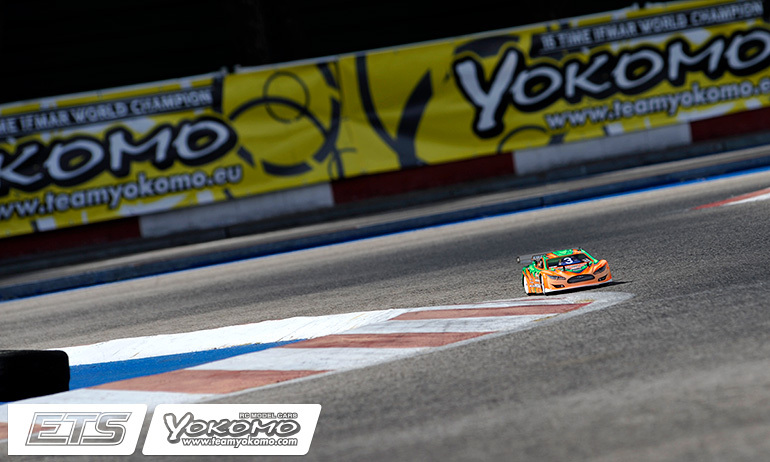 With sunshine finally appearing from behind the clouds to speed up the drying of the track when things did get back on track it was Volker who lead away having been fastest in Thursday free practice from Bruno Coelho. Coelho looked to be on target for P2 also in the opening qualifier until a mistake with a minute to go which would benefit Marc Rheinard and Freddy Sudhoff who ended up 2nd & 3rd fastest respectively ahead of the reigning champion. Winner here last year, Alexander Hagberg ended up only P9. Summing up his TQ run, his advantage 1.3-seconds over Rheinard, Volker said, ‘I am very happy to keep up my practice pace in Q1. I was always in the Top 3 on Thursday. It was nice to start with a TQ after the delays’. 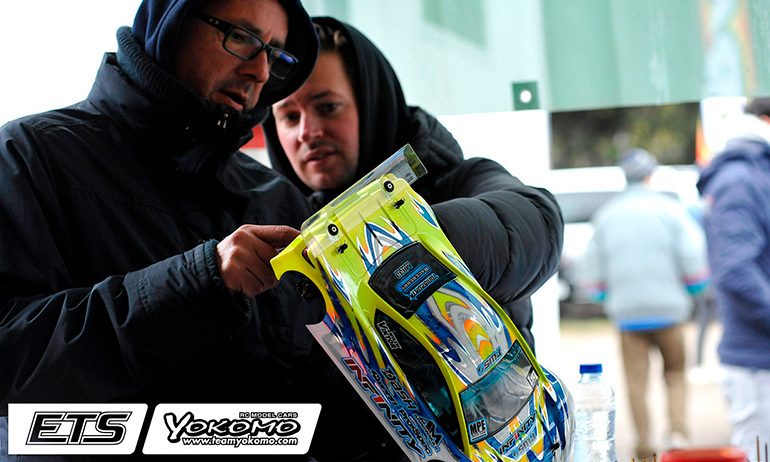 The Yokomo driver added, ‘it is a crazy situation here to wait so long and you have the extra challenge to get warm enough to drive’. 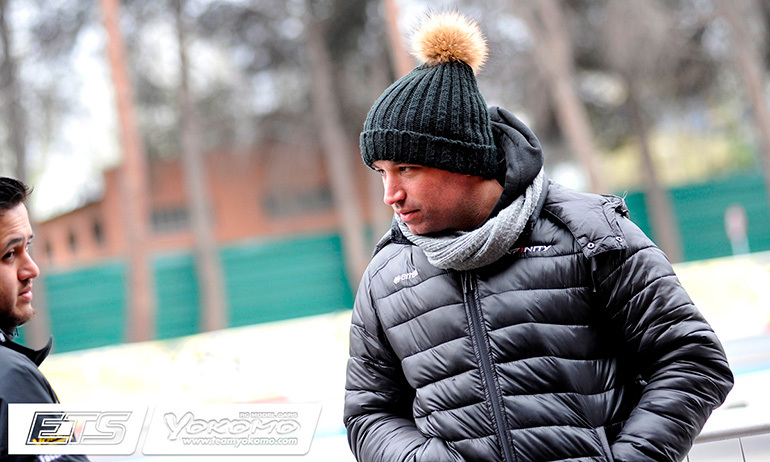 With drivers dressed more like they are waiting to go skiing rather than RC Racing due to how cold is it here in Madrid, the championship leader continued, ‘I thought I was going to lose the qualifier during the run as Bruno was catching but I was able to keep my rhythm. I am definitely happy with the car. I wasn’t able to test as much as I wanted for this race because of the weather here in Europe but compared to previous outdoor seasons it looks more promising now with my LRP powered BD9. Asked about set-up changes for Q2, which will hopefully take place tonight once the weather stays on side, the German said, ‘when the track conditions come up we will go back to the shock and diff settings from two days again but these are only minor changes’. ‘A solid start’, was Rheinard’s reaction to the opening qualifier. The Infinity driver added, ‘I suddenly made a 360 (degree spin) onto the loop on the second lap and lost about a second and then Ronald punched it over the loop (at the finish) which gave him 4/10th. Anyway it was a good start after the long break and the track having no grip and a lot of wind too’. Looking to the second qualifier, he said, ‘It should be faster the next one. I wont change the car because it will be hard to tell if its the track or car that changed’. Reacting to his performance, the German having set himself up with a fan heater on his pit table, Sudhoff said, ‘They were tough conditions. It is pretty close between Ronald, Marc, Bruno and myself’. The Awesomatix driver added, ‘the car is performing very well since the first practice here (on Thursday) and I just made some small changes. The next round is going to be super important. I think it will be quicker and with 1 out of 2 to count all is still wide open even for the TQ. Asked if he planned any changes for his second qualifier, the German said, ‘I will adjust the speedo if the traction is higher’. ‘It was a good run until the fourth minute when I touched the curbing at the start of the straight and flipped. I lost 2-seconds’, was how Coelho described his opening effort. Asked about the track conditions the Xray driver, and 2017 Spanish winner, replied, ‘it was tricky and it was super windy which you could feel on the car. At the start my car was good but then it started to get loose in the rear but that doesn’t justify my mistake’. He concluded, ‘we will change small things for the next one to make it easier to drive. Conditions are very difficult and the traction is low but I hope the there will be more grip the next one’. Setting the fifth fastest time, Viktor Wilck said his run ‘was OK’ explaining, ‘the beginning was ok but after a little while I had traffic with Kaufmann and then I spun on the curb. It was tricky but all in all it was a clean run’. Looking to Q2 the newest addition to the Infinity team line-up said, ‘I will change a few things and think maybe I will try running the car a little narrower’. Having ended a four year spell of no ETS wins here 12-months ago, when asked about Q1 Hagberg replied, ‘It was not great. Either the lack of grip is not suiting my set-up or I need to improve my tyre prep’. The Xray driver added, ‘the limited track time in particular is difficult for me but we will work harder for the next round (of qualifying). 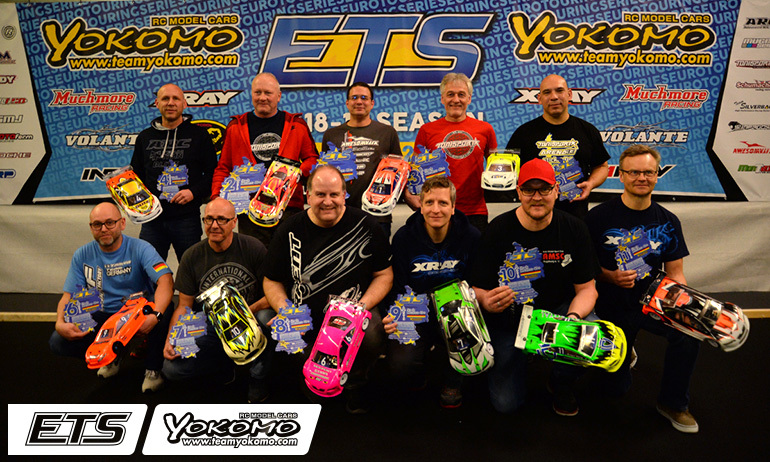 In the Pro Stock class joint championship leader Simon Lauter produced the TQ ahead of a gaggle of his Awesomatix team-mates. 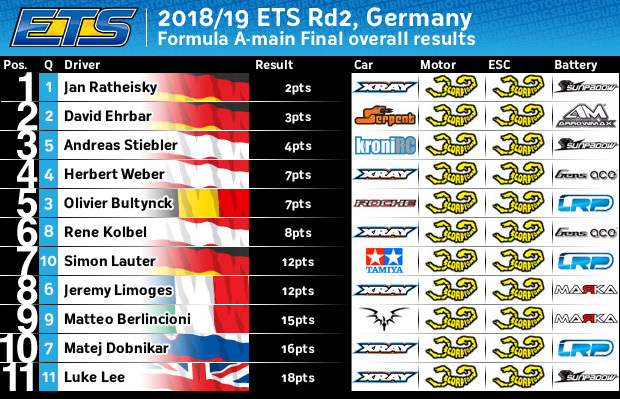 Making the switch to Awesomatix since Round 2 of the ETS in Germany, Dominc Vogl was second fastest with Christian Donath completing the Top 3 followed by Olivier Bultynck, Max Mächler and the first non Awesomatix driver Jan Ratheisky. In Formula, Ratheisky topped the times from Bultynck and Lauter. 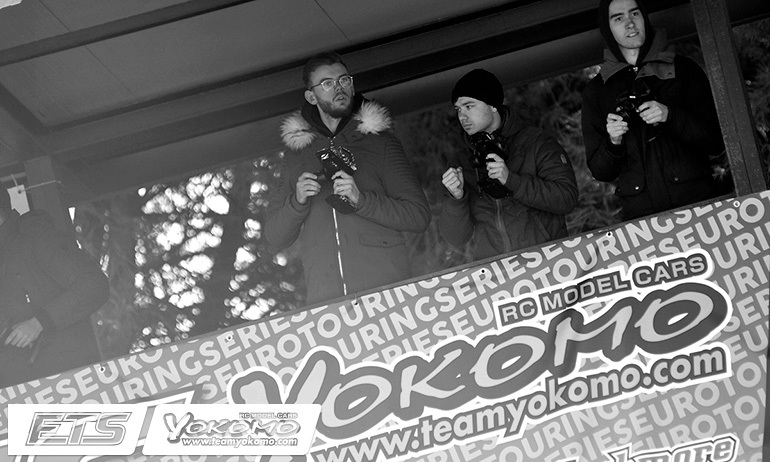 It should have been the official start of the outdoor season of the Yokomo Euro Touring Series this morning in Spain but the weather has meant otherwise. 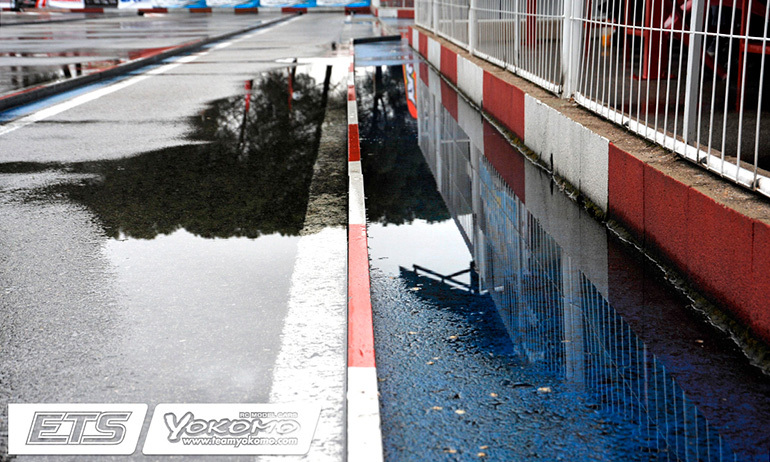 After a day of dry free practice yesterday at the Asoger track, Round 3 of the Championship was officially set to get underway today with controlled practice and the opening round of qualifying, however rain put pay to anyone hitting the track today as racers woke up to a gloomy cloudy day in Madrid. First making the call to wait until 14:00 local time to decide whether any racing could take place, heavy lunchtime rain forced the call that the day would be cancelled. With weather not looking much better for tomorrow, the current call is that each driver’s fastest three consecutive laps will determine the heat order as they go directly into qualifying if the weather plays its part. Based on Thursday’s times, drivers managing 6 rounds of practice, it was Ronald Volker who was fastest from Bruno Coelho with Freddy Sudhoff third. 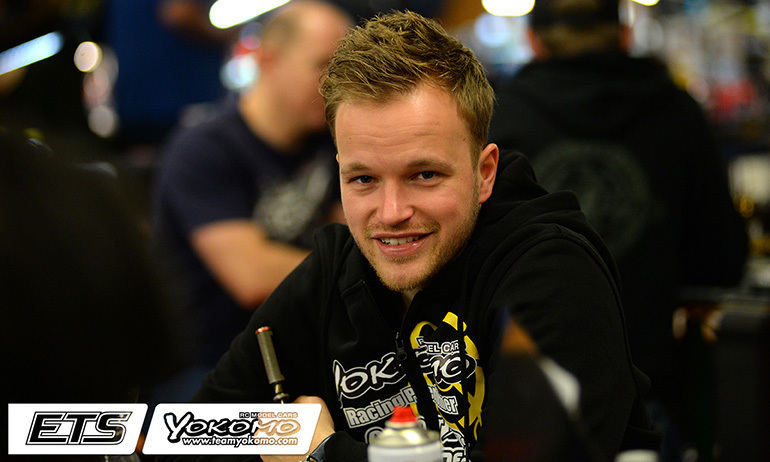 Last year’s winner Alexander Hagberg found himself down in 11th. 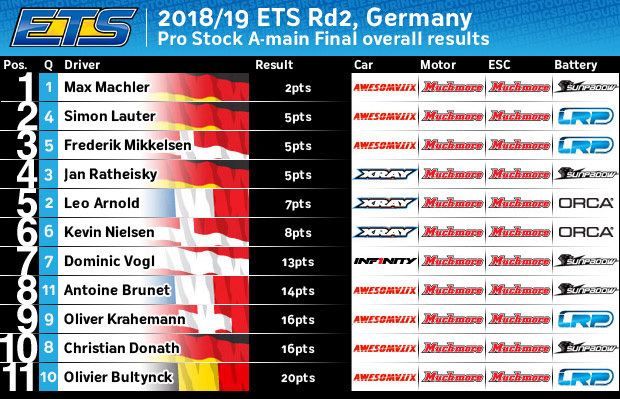 In Pro Stock it was joint championship leaders Simon Lauter and Max Machler who set the pace ahead of Olivier Bultynck, Christian Donath and Dominic Vogl. In Formula Jitse Miedema was quickest from Lauter and Jeremy Limoges. 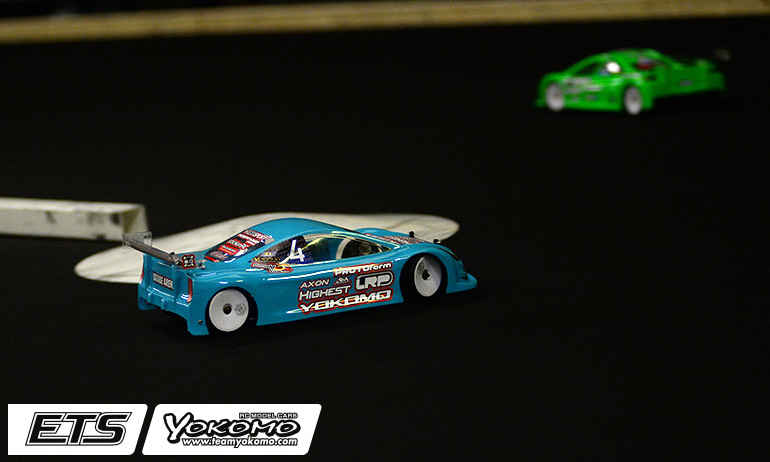 The European outdoor season gets underway this weekend as Spain plays host to the third round of the Yokomo Euro Touring Series. 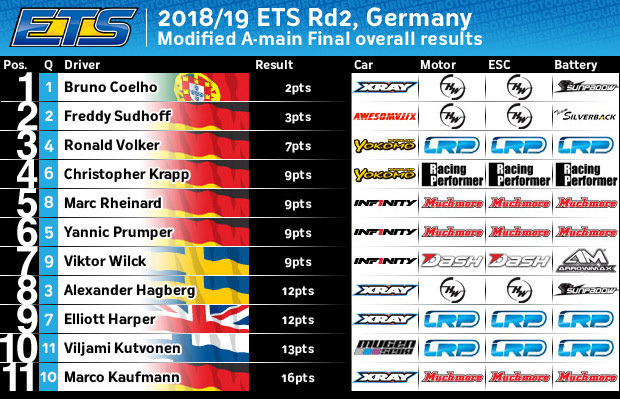 With the 12th season of the ETS producing two different winners on carpet in Austria and Germany, Round 3 will makes the change to asphalt with most drivers making no secret to the fact that this is there preferred surface to race on. 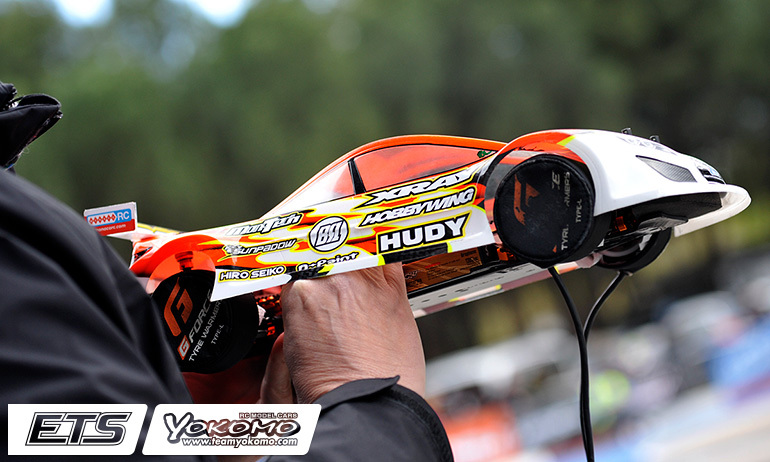 The third year the championship has travelled to the Asoger RC track near Madrid, the two previous visits have seen it be a happy hunting ground for Xray. 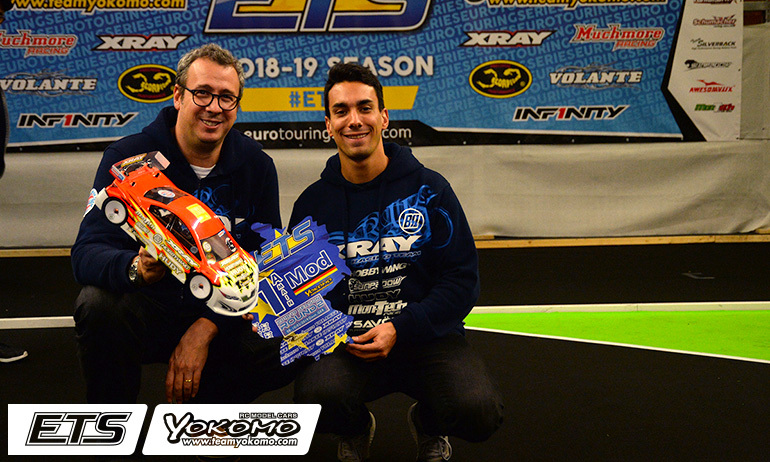 Reigning champion Bruno Coelho took the TQ and victory over Marc Rheinard in 2017 and last year team-mate Alexander Hagberg ended a 4-year ETS winning drought with the win over Yokomo’s Christopher Krapp. While unwanted weather conditions forecast for the weekend could influence the weekend’s action, all the teams will be looking to conclude the first half of the season with what is viewed as an important win given the rest of the championship will be played out on asphalt. Xray certainly arrive in Madrid with the best track record. 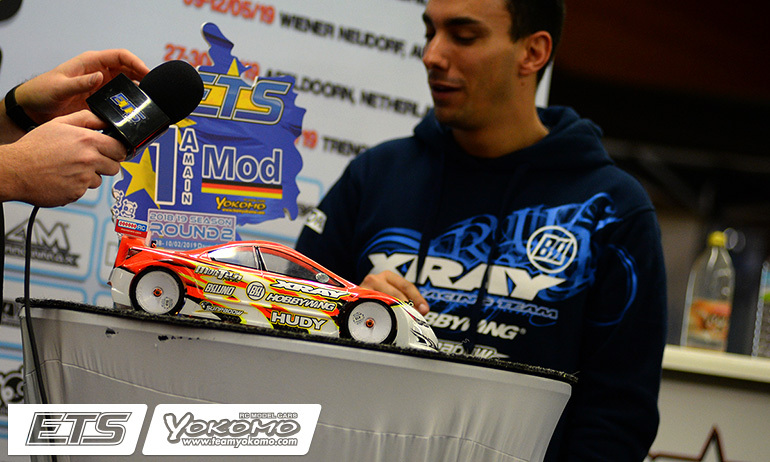 While Coelho didn’t have the best of starts to the defence of his third consecutive title, he made amends last time out taking maximum points with the TQ and win over a very impressive performance from Awesomatix’s Freddy Sudhoff. While somewhat unique conditions in terms of humidity and an ever changing track as a result, Hagberg showed the world his asphalt pedigree by winning the recent TITC in Bangkok and comes into this weekend on the high of yet another European 1:12 Championship title. Xray also have new 2018/19 season recruit Elliott Harper, the track and forecast weather something which should suit the British driver. After his strong challenge on Coelho that was rewarded with a very popular second place in Daun, Sudhoff will be aiming to again be the amateur who puts it up to the pro drivers. Not a full time RC racer like his rivals, the German was 5th last year in Madrid but with Awesomatix team manager Max Machler more and more hands on with the preparation of the Russian manufacturers car this combination seems to be working well as was also highlighted at the World Championships last year in South Africa. 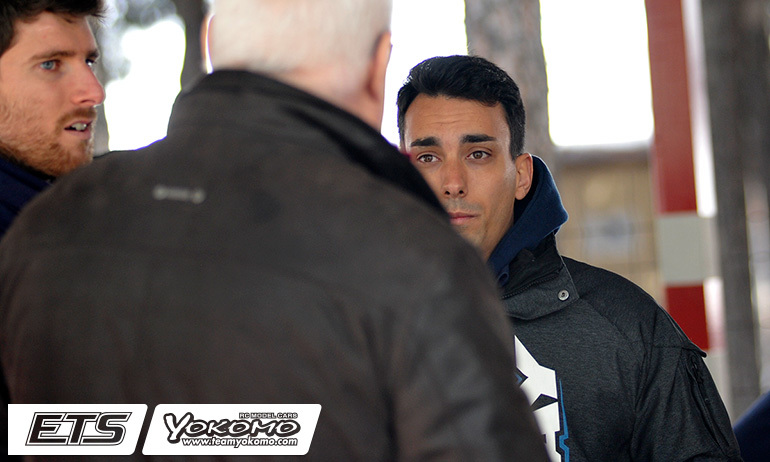 Yokomo came so close to the win in Madrid 12-months ago in the hands of Krapp when the final outcome came down to a tiebreak decided on times. 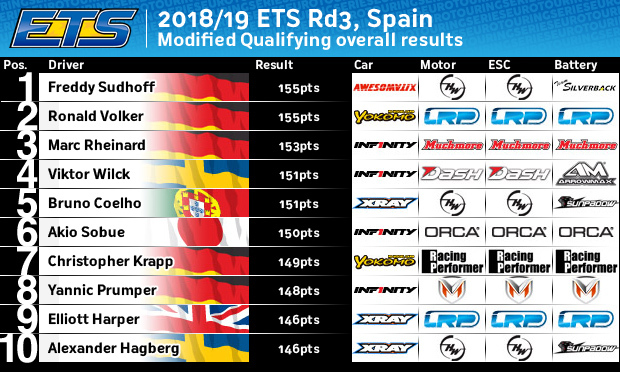 With his only ETS win so far coming from his Kyosho days on the Spanish island of Gran Canaria, the German will be aiming for similar success this Sunday. 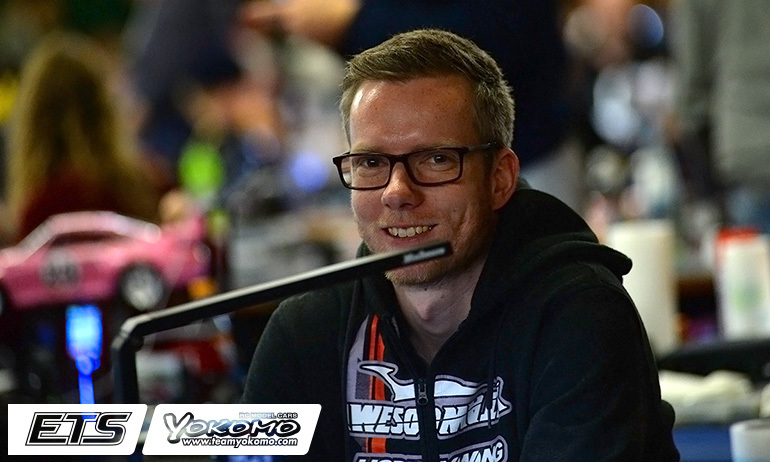 Team-mate Volker, who qualified 2nd last year but finished up 7th in the finals, arrives into the weekend as the championship points leader ahead of Coelho thanks to his Round 1 win and somewhat surprise Round 2 podium given how his weekend started off. Having made the Spanish podium in 2017, he will be aiming to finish ahead of the reigning World Champion. 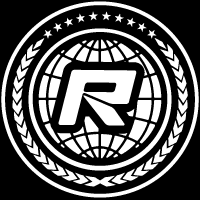 Infinity will be looking to lay claim on their for first ever ETS win on asphalt in Spain. Fresh from taking the overall win at the OneTen Series Finale in Hong Kong last weekend, Marc Rheinard leads the Japanese company’s strong line-up. Rheinard makes no secret of his preference for outdoor racing and knows he needs a good result this weekend after a disappointing home round in Daun which leaves him fourth in the standings. 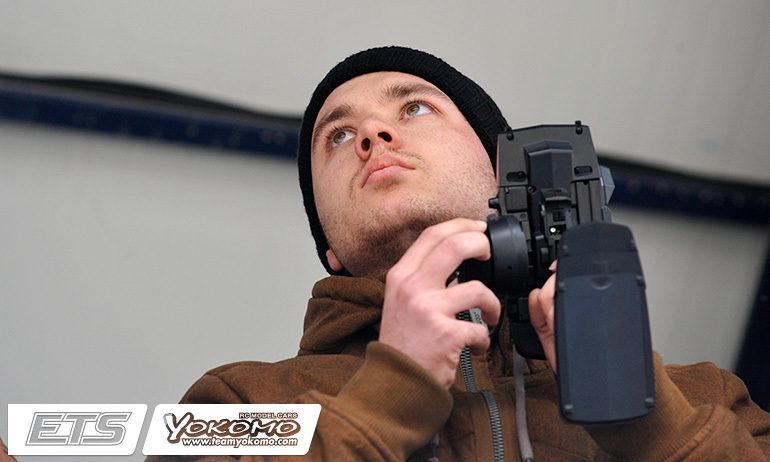 This weekend will mark the return of Jilles Groskamp to ETS action and his technical input is always beneficial to the entire team. 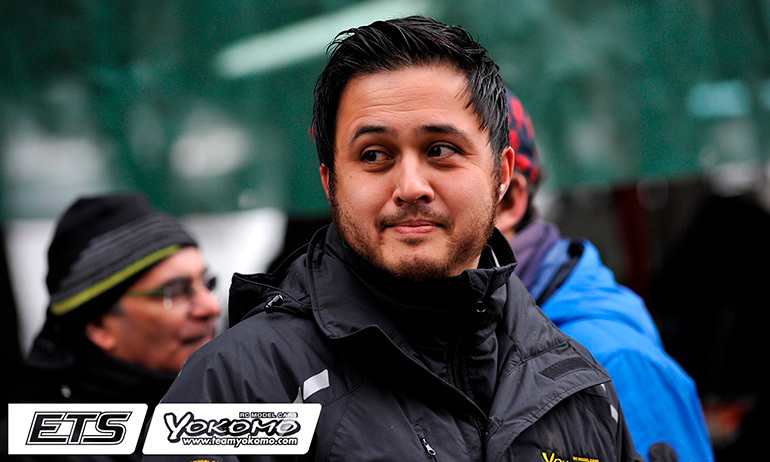 Having made his Infinity debut at the previous round, Worlds podium finisher Viktor Wilck will be looking for a strong showing as will Akio Sobue after he missed the A-Main cut in Germany. 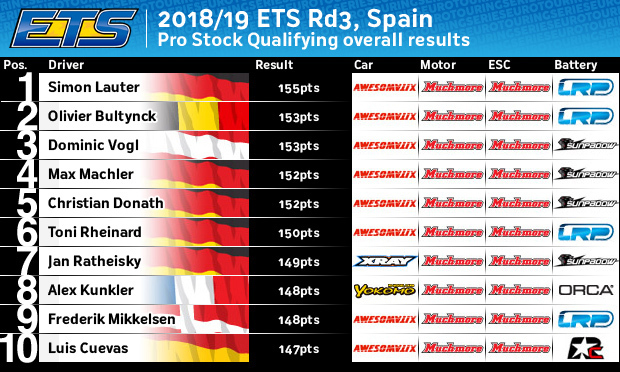 In Pro Stock things couldn’t be any closer at the top of the points table as racing moves outside with Max Mächler and Simon Lauter sharing the lead. With the Awesomatix team-mates having a win each on carpet, Mächler comes into the weekend having taken the win here last year. 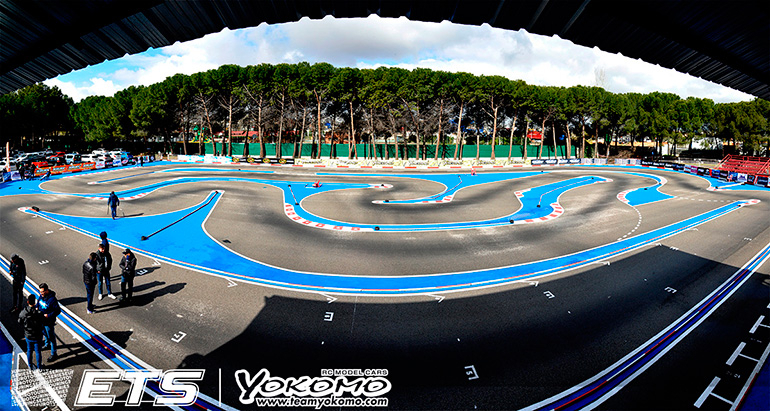 Again the ETS will also see racing action for Formula, 40+ Masters and the newly introduced Stock 17.5 class class.